Knowing your way around B2B social media marketing is an essential part of PR and marketing work in 2017. Here is a breakdown of the moving parts to keep on top of what is important. To read more about finessing a B2B social media strategy to succeed in comms, download our ebook, The 4 Cs of Social Media Marketing. Social media has entirely reshaped the way the world communicates. Instead of relying on celebrities, large news corporations and the television for world news and information, people are able to freely share, communicate and engage amongst themselves. And B2B social media marketing is part of that. We’ve already seen huge success amongst B2C marketers, with brands consolidating a name for themselves in their target audience. However, B2B social media marketing can feel a lot more difficult to get right. When you’re targeting other businesses, negotiating a world of engagement, followers and likes can feel impossible. First things first: you need to get onto the right social networks. The rule of thumb here is to find a balance between establishing your business on more than one platform, but not spreading yourself so thin that you can’t really focus. While LinkedIn remains the most popular platform for B2B marketers according to Content Marketing’s 2016 statistics, it is by no means the only platform you should be using. B2B companies are consistently showing the impact they can have on a range of social media platforms provided they’re sharing content that resonates with their audience. 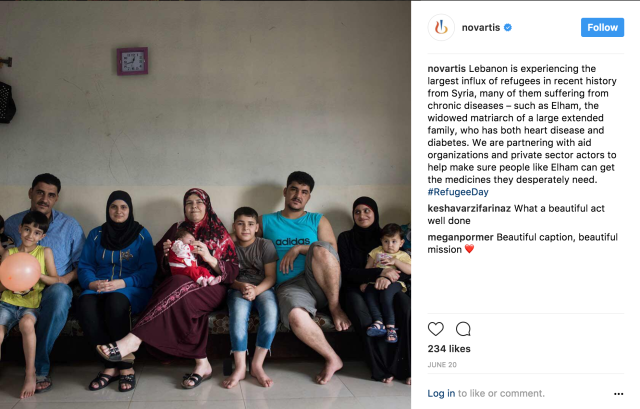 A great example here is Novartis, a pharmaceutical company that has generated a large following on Instagram by sharing posts on the humane side of their work. It’s creating a genuine connection with its audience that has massively boosted the relatability of the brand. To establish the best platforms for your company to use, take a look at your competitors’ social media accounts. As you’re in the same industry, what works for them is often what will also work for you. If you see that your competitors have managed to grow a huge audience via YouTube or Twitter, these platforms may be the best places for you to target first, because you know there’s an interested audience waiting. Your profile needs to instantly reflect your company’s brand on every social media network, and needs to be immediately recognizable. That means using the same profile picture — ideally your logo — across all platforms, and using a consistent tone of voice. Remember: social media is where businesses can show their less corporate side, and provide content users can relate to. Keep your profile descriptions professional, but remember you’re writing to connect with people, not to sell them your CV. Your profiles need to be created with your target audience in mind. By this point, your company should know its values, mission statement, and the type of customers it wants to attract. Build your profile around this aim. If you are going for a target audience of, for example, entrepreneurial-minded men in their 30s and 40s, build profiles that are designed to entice people from this pool. Explore your social network settings and management dashboards to find these useful free resources. Another key tool to use for tracking your clicks is Google Analytics. This will show you how much of your website traffic comes from social media and — more specifically — which platforms are referring visitors. Google Analytics is a must-have tool for gaining a valuable insight into your site traffic, referrals, acquisition and more. Successful B2B social media marketing takes knowledge, research, and commitment. It is not enough to establish yourself on a few platforms and wait for people to follow your profiles – you need to be posting fresh, interesting content that is relevant to your audience, and you need to be doing so consistently. For many companies, this means hiring a social media manager to take charge of your accounts and strategy. You can use an existing employee for this, but remember that a successful social media strategy does take time and effort, and isn’t just a small task to add on to someone’s already busy list of responsibilities. “Our industry is too boring for social media”. Both of these are total myths. Any B2B company can and will be successful on social media with a proper strategy and content that actually engages your audience. A company that constantly posts nothing but calls-to-action and links to services isn’t going to build a large following very easily. 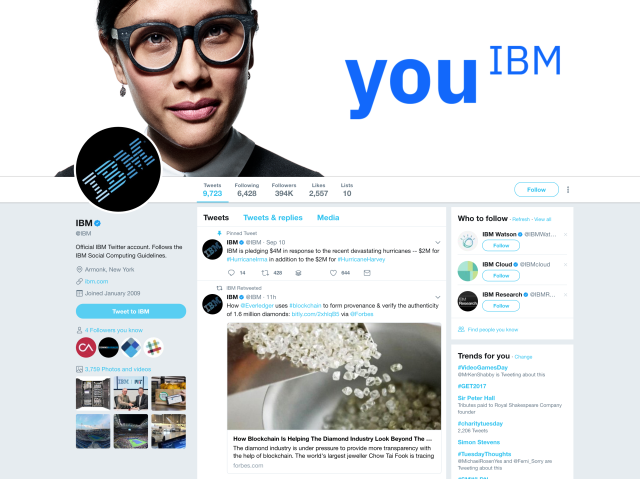 IBM’s Twitter account is a great example of how sharing content that interests your audience can be extremely effective — more so than broadcasting your services continuously. Interest the audience and encourage them to share, retweet and engage. This is far more effective than constant posts linking back to IBM’s services. B2B social media marketing is about building a brand – not about driving sales. This is the most important thing to keep in mind when planning a social media strategy. You don’t want to appear to be a faceless corporation doing nothing but trying to sell services to other companies. Social media is your chance to give your company a personality, to connect with your target audience, and to establish yourself as a known name within your industry. By creating quality content that interests your target audience. When creating content, think WIIFM? Your target readers will only click a link if there is something in it for them. Aim to create an emotional connection with posts that benefit your reader, not your company. Your target audience isn’t a large corporation. It’s a business owner. A real person who wants to save money, boost productivity, and make his or her office a better space for employees to work in. Consider hiring a professional business blogger to improve the clarity of the blog posts that you’re linking to and really promote the benefits of your brand to your key audience. There are varying opinions when it comes to long-form vs short-form content. When it comes to blog posts, typically the longer and more informative a post is, the better it’s going to do on SEO and with readers actively searching for answers. However, when it comes to B2B social media marketing, keeping your posts short and snappy is more effective. This comes down to the basic principle of readability. Use copy that is ambiguous enough to intrigue your audience to click your links, or that is going to stand-out in their news-feed. While long-form blog posts are ultimately more useful to your audience, paragraphs of text isn’t always welcome on their social media feeds. Social media is the ‘behind the scenes’ area for many companies. This is the space where you can let your hair down and be far more social with your audience than you are on your website. Don’t be afraid to share jokes and humor with your audience. Often, these types of posts do best in terms of engagement and make your company appear far more human to readers. Be sure to establish guidelines when it comes to sharing humor on social media, however. There’s a fine line between sharing jokes that connect with your readers on a personal level, and sharing ‘humour’ that some could find offensive. That could harm your company in the future. Social media is not as simple as posting as and when you can – but you know that by now! A consistent and planned schedule to target your audience, when they are at their most active and engaged, is key. Many of these tools offer free plans that micro-businesses can use to get started. Once you start earning ROI from your social media accounts, you can ramp up to paid plans. Automating your blog post schedule is also a great way to help your social media marketing strategy run smoothly. Adhering to a consistent posting strategy — whether that’s twice a week, fortnightly, or monthly — will provide a stable calendar around which you can focus your social media strategy. Keep an eye on what is popular on social media, and consider scheduling a well-timed blog post to share with your followers and drive traffic. If you hit the right nerve at the right time, your post could even go viral, which is a prize well worth pursuing. Can B2Bs Go Viral Like B2Cs? Creating viral content as a B2B company is, admittedly, more difficult than it is for B2C companies. That’s because rather than targeting the general population, you have a more specific audience with more specific needs. Going viral isn’t an easy task, and it can often be an extra dose of luck for one post to take off when others don’t. The thing to remember is to aim to connect with the people behind the businesses you want to target. Creating a human connection with your audience is what will encourage people to share and engage with your content. Facebook: 9am, 1pm, and 3pm. In any B2B social media marketing project, measurement is key, and you will start to get a feel for the best times to post after a few weeks. At this point, we’ve covered the importance of using social media to show the relatable, personable side of your B2B company. A key part of this idea is then interacting and engaging with your followers, adding to the authenticity of your online brand. Monitor your feeds for related content and responding. A great example of this is when companies respond to one person’s viral story by offering them a free service in response – a great PR opportunity for the savvy brand! It’s important to maintain a consistent tone on your social media platforms. It’s here where having one person assigned to manage your social media accounts is particularly useful – if multiple people are responding to comments on social media, your readers will notice. Setting brand guidelines is a great way to establish what tone of voice you want your company to have, and making sure that all accounts reflect this voice. A good aim is to be friendly and relatable but to still maintain a professional approach. It’s important to remember that your business account is not a personal space to express your own opinions. A big fear for both B2B and B2C companies is that a customer will use social media to try to damage your reputation with bad reviews. While this can and does happen, it’s important that you have a strategy in place for dealing with such situations. Acknowledge your customer’s dissatisfaction and try to find a remedy. Engage in arguments on social media. Social media – particularly LinkedIn and Twitter – works best when users are all connecting with each other. That means following the right people to help grow your audience. Think about the people you want to target and the people that will be interested in your content. These two groups should be almost identical. Find them online. Connect with them, and they should follow you back. Once you’ve built up a good number of connections, you will have boosted your chances of your content being shared by your audience. Be careful not to be drawn into a ‘follow-unfollow’ strategy as a business, where you follow influencers and unfollow the ones that don’t reciprocate. Although this used to be a recommended tactic, you’re better off making carefully selected connections and letting your content and engagement speak for itself. When looking to grow your audience using B2B social media marketing, one of the best places to look is at your competitors. Check out their social media accounts and see what type of content has been successful for them. Of course, you don’t want to mimic another company and certainly want to keep the authenticity of your brand, but the popular content is popular for a reason. If infographics, for example, prove particularly popular with your industry’s audience, focus on creating the best version of those infographics available. When you are investing time and money into your social media marketing strategy, measuring your progress is essential. This is particularly important if you are going to be paying for ads on Facebook – which can be hugely successful, but can also waste a lot of money if you aren’t focused. Growing your brand awareness or engagement. Defining these goals beforehand ensure your campaign is tailored specifically to hit that mark, instead of simply hoping for undefined results. Once a B2B social media marketing campaign has run its course, be sure to analyze everything that was successful and that failed throughout the campaign. If the campaign hit your goals and beyond, you’ll know how to replicate that success in future. Likewise, if the campaign completely missed the mark, you’ll know to reevaluate your strategy to avoid wasting money and time on similar ad campaigns in the future. Leads should not always be the immediate focus of a B2B social media marketing campaign, but they are a could way to monitor your progress in the long-term. Analytics that can measure clicks, engagement and social media leads will be able to show you how much your social media campaigns have helped your business. Finally, a good way to measure and monitor your growth on social media is by using tools to track mentions, shares, and backlinks to your company. Software to monitor your brand also includes a keyword search so you can monitor your industry and competitors to see how they are doing. Tools for this include Meltwater’s media intelligence platform and Google Alerts. Simply set up a Google Alert so that you will be made aware of any sites mentioning your company or your company’s social media accounts online. This is a great way of interacting with your followers and potentially sharing content that positively reflects your brand. A successful social media strategy can have enormous benefits for your company in terms of popularity, brand awareness and audience growth. For the best chance of success, you need to be able to commit time and some serious planning to your strategy, which is why outsourcing to a social media manager is often a better strategy for B2B companies than trying to manage your social media yourself. Social media managers have the previous experience to set up your profiles and immediately start marketing your brand effectively – saving your company the frustrating first months trying to find the right voice for your brand and profiles. What’s more, social media managers ensure your marketing efforts have a consolidated, clear goal. Many B2B companies assign social media to admin departments as an extra task, meaning campaigns can often be forgotten, and social media posts having a mix of messages due to multiple employees managing the accounts. This article originally appeared in Red Robot Media, was written by Yasmin Purnell from Business2Community, and is legally licensed through the NewsCred publisher network. Please direct all licensing questions to legal@newscred.com.